Donald Trump has never been more unpopular than he is now. Or so the latest round of polling on the president’s handling of the government shutdown suggests. Fifty-nine percent of voters disapprove of Trump’s overall job performance in CBS News’ latest survey, the highest that figure has been since the president took office. That finding is buttressed by a new Politico–Morning Consult poll, which puts Trump’s disapproval rating at 57 percent, the highest it has ever been in that pollster’s research. Notably, these figures aren’t drastically worse than the president’s typical poll numbers. A majority of Americans disliked Trump on the day he was elected, and have continued to dislike him ever since. Nonetheless, even marginal declines in Trump’s base of support would likely be enough to nullify his hopes of reelection, given how narrowly he eked out an Electoral College majority in 2016. Morning Consult’s poll, meanwhile, finds that 54 percent of Americans blame Trump and the Republicans for the shutdown, while just 35 percent blame congressional Democrats. Notably, the percentage blaming Trump has climbed by 6 points in that survey since the shutdown began, suggesting that the president’s prime-time advocacy for his position failed to win hearts and minds. The survey also shows that 49 percent of voters oppose the construction of a border wall in any circumstances, compared to 43 percent who support it. These results should matter to the president. His decision to inflict financial hardship on hundreds of thousands of Americans, reduce economic growth, undermine public health, and jeopardize border security — for the sake of coercing Congress into voting for a wall that a majority of Americans oppose — has never been popular. But it’s growing unpopularity should disabuse the White House of the idea that it would eventually win (at least) the entirety of the GOP electorate over to its view of things. Trump could have made Nancy Pelosi’s life difficult. Like past presidents who suffered midterm rebukes, he could have triangulated and pushed for the passage of a minimum-wage hike and infrastructure package — thereby forcing Democrats to choose between opposing popular policies and giving Trump bipartisan “wins.” Instead, he has opted to provide the public with a weeks-long affirmation of Democratic attacks on his capacity to govern. Even if he manages to extract his ransom by the end of this, Trump will (almost certainly) emerge from the shutdown with bleaker prospects for reelection than he did late last year. But the president is not a rational political actor. He is a narcissistic Fox News addict who craves nothing so much as his favorite television hosts’ affirmation. He is courting Rush Limbaugh’s approval, not that of swing voters in the Milwaukee suburbs. From the first day of his presidency, he has made clear that he believes his job is to aid those Americans who’ve demonstrated loyalty to him, not the public as a whole (let alone to the majority who reject him). And he is also ostensibly aware that his indifference to the fate of most Americans gives him a peculiar source of leverage in the present standoff. Democrats care about the plight of unpaid federal workers (not least because they are in the aggregate a Democratic constituency), food-stamp recipients, and various other Americans whose basic needs are threatened by a prolonged shutdown. Trump, by contrast, recently orchestrated the mass psychological torture of migrant children; he is not going to be moved by humanitarian concerns. The president’s intransigence may further erode his popular support. But it could also plausibly increase pressure on Democrats to pay the terrorist’s ransom: While a large majority of voters in CBS News’ poll favored reopening the government without wall funding, 52 percent also suggested that they’d prefer Democrats to fund the wall for the sake of reopening the government, if that is what it takes. All this said, even if the new poll numbers make no impression on the president, they make one on the mainstream media. It is now clear that the president is sabotaging the functioning of the federal government in defiance of a supermajority of the public’s will. 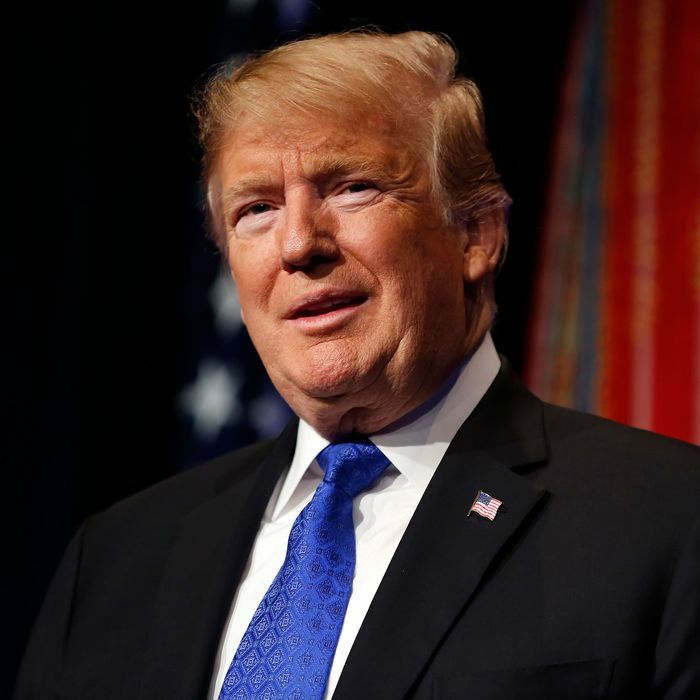 His substantive argument for the necessity of the border wall is incoherent; his claims of concern for border security belied by the shutdown’s corrosive impact on the security of America’s borders. His demand has no popular, substantive, or procedural legitimacy. There is no reason for “objective” media outlets to pretend otherwise.